Will Jimmy Canty be the youngest Black Master? James "Jimmy" Canty III turns 14 today and has a bright future waiting ahead of him. The proud chess shark from the city of Detroit is rapidly gaining a notoriety as a force to be reckoned with in scholastic chess. Jimmy won his first scholastic title in the under-1250 section with a 7/7 score at the 2002 Nationals in Tucson, Arizona. Since then he has helped Bates Academy win accolades at national tournaments. A recent graduate, Jimmy will enter the famed Cass Tech and begin his high school career. In an exclusive interview with The Chess Drum, Jimmy explained that his father James Canty Jr. taught him to play four years ago. It took a year before young Jimmy could beat his Dad and his improvement has been steady ever. Besides the early tutelage from his Dad, Jimmy gained instruction from Harold Steen and National Master Bill Calton. Calton reported that Jimmy had tied with Tim Moroney in the Michigan High School Championship on March 25-26th with 4½-½, but took the trophy on tiebreaks. At the Chicago Open in May, he scored an impressive 5-1 and tied for 2nd in the under-2000 section. Jimmy scored 5½-3½ in the under-2000 section at the recently-ended World Open. This is most certainly be his last tournament in that section as his rating has already eclipsed the 2000 rating that defines a US Chess Federation "Expert." Jimmy had a reputation as a fierce blitz player and took joint first with Landon Brownell at National High School Blitz tournament with an 11-1 score. He told The Chess Drum that he had officially earned qualification for this year's Denker Tournament of Champions, but was disqualified because he was not yet in high school. After going 25-0 in the K-8 section during the year, his father put him in the high school section where he won the championship. At the 2006 World Open, he took on several masters in blitz matches. His speed and skill impressed the likes of Stephen Muhammad, Oladapo Adu, Ernest Colding and Sylvester Smarty. He also played a friendly against fellow scholastic star, Jacob Wamala. 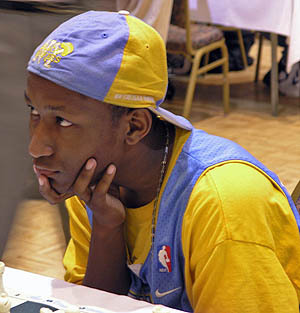 In an interview with The Chess Drum's Daaim Shabazz, he stated that he learned a lot from playing strong masters and that he had never met such strong Black players. Jimmy has more than one year to break the record for the youngest Black Master in the United States Chess Federation. Howard Daniels of the legendary Vaux teams of the late 70s became a National Master at 15 years 4 months. In the interview, he states that he would like to become a master as quick as possible and then set aspirations for International Master and Grandmaster. Interesting words from an ambitious young man. Listen to Canty interview now!